You are here: Home / blog / Most frequent or most typical collocations? Most frequent or most typical collocations – which is more useful? 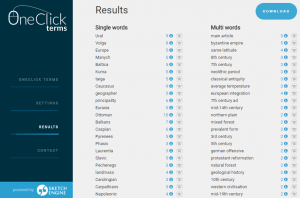 Looking at the page gives the user an instant idea of how the word is typically used, in which context it appears most frequently and what the typical word combinations are. The user can also go directly to the actual sentences from which the information was extracted to check the context in detail. The combinations are divided into categories such as modifiers, verbs, objects or subjects of a verb etc. 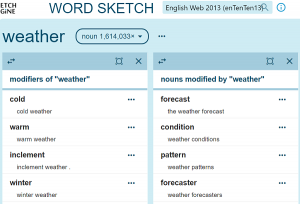 Apparently, each word can form more word combinations than those displayed in a word sketch by default. So how does Sketch Engine determine which collocations should be displayed? Where is the cut-off line? 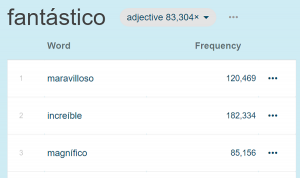 Users generally assume that this happens on the basis of frequency and that the collocations at the top of the list are the most frequent collocations. This would be, in most cases, not very useful as we will see further below. Sketch Engine takes a different approach and focuses on the typicality (or strength of collocation) rather than frequency of use. What is the difference between frequency and typicality? Looking at the list, one notices that most of the words are very predictable. In other words, if a student of English wants to speak about a bedroom of a small size, they will naturally use the word small. They will not usually need to consult a dictionary to make sure that small is a suitable word combination. Similarly, when teaching bedroom as a new word, it is not useful to point the student to collocations such as small, own, big or comfortable because they are quite predictable. 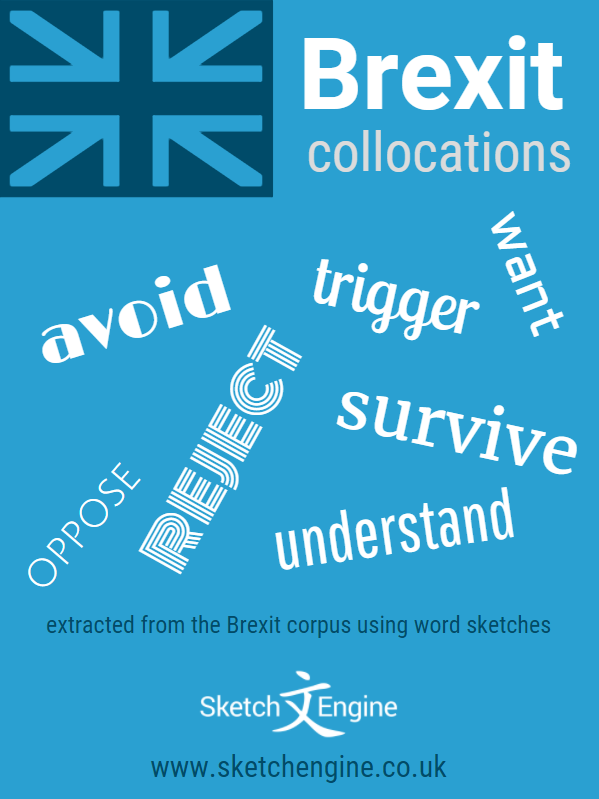 The collocations in this list would be classified as weak collocations. This list is more useful for language learning and more interesting for linguists and lexicographers. 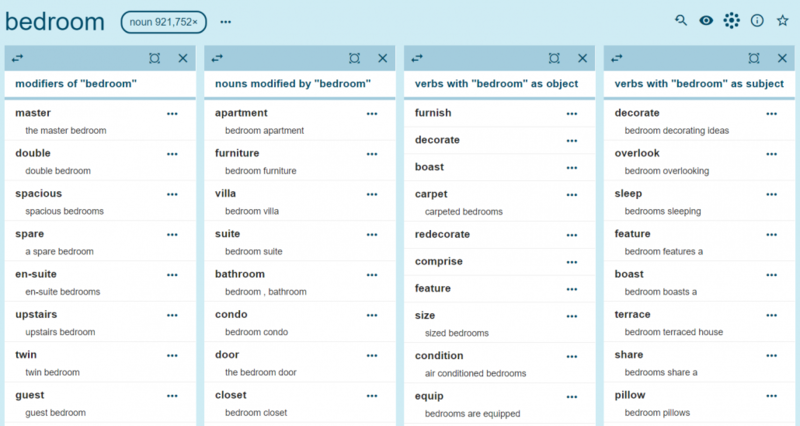 It all depends on the language level, of course, and the first list might be actually of some use to beginners but it is the second list that we would expect to see when we want to learn how word bedroom is used in English. How does the software do it? By default, the collocates in a word sketch will be sorted by the score and the top 25 items will be displayed. The user can change this limit and also switch to sorting by the frequency which will put the less typical (and from the teaching point of view also less advanced items) at the top. Learn to work with collocations in Sketch Engine in 4 minutes.